Kurt, I don’t know if you have ever considered this, or talked about this, or spoken to the fans about this, but the people who I have spoken to are all big Superman fans, and see the character a little too held back. What do I mean? Lois Lane. I feel that Superman has always been held back by Lois. I feel that Wonder Woman would have been the perfect match for Superman to fall in love with. Perhaps it’s my personal like for Wonder Woman, but as a long time reader of your work and a long time Superman fan, I always feel that the love and relationship the Man Of Steel deserves is not with Lois Lane, but with Wonder Woman. She, as well, deserves someone special, and the Man Of Steel, in my opinion, would be the perfect match for her. 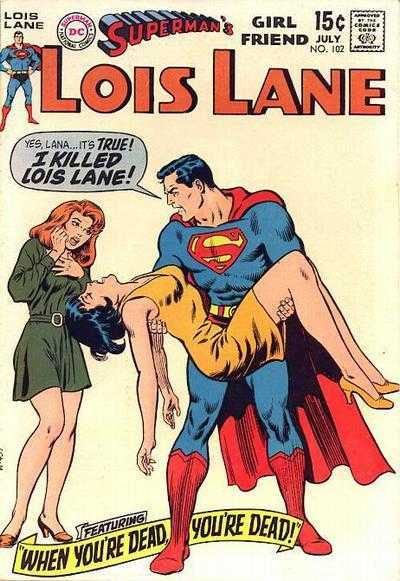 I have spoken to a few people, and they and I would like to see a story arc written about “The Death Of Lois Lane.” What would this story arc be about? It would be about Lex Luthor attacking Superman at his core: His love for Lois Lane! What would this do? Open an opportunity for Wonder Woman and Superman to become closer, and eventually fall in love and get married. A story arc like this is one I would love to see happen as a canon, mainstream story for Superman, and I thought about no one better to create a masterpiece like this than the legendary Kurt Busiek. If you could make this happen, it would make a Superman fan’s dream come true. Superman deserves a child of his own, not raising General Zod’s child. I feel he should have a child with Wonder Woman, who she as well deserves someone. I know the risks in making a story like this, and that is those that are fans of Lois. Perhaps Lois could do something else and fall in love with someone else? I don’t know, but there are a lot of people out there, and I believe more, that would like to see Superman get together with Wonder Woman. Superman would never dump or cheat on Lois. It is not in his nature, but if she died it would open up the doors for Superman and Wonder Woman to get together. I would really like to hear from you about your ideas and if you have ever thought about doing a story like this, and if so, would you create it? I really would like it if you did. Thank you for your time Kurt. God Bless. I’m not your guy, Gabriel. First off, I like Lois. I like her as a character, and I like her in her role as part of the Superman cast. I think it’s a very good idea, for the themes and context of the series for Superman to be romantically attached to an ordinary human. An extraordinary human, to be sure, but a regular, normal-type person, who grounds him in his human identity and connects hi to the adopted world he loves so much. I think having Superman involved with a superhuman like Wonder Woman is a fine idea for what used to be called “Imaginary Stories,” and now are called “Elseworlds,” like Kingdom Come, where Clark and Diana did, as I recall, get married and have a baby. But I don’t think it’s a good idea for the ongoing series, because it removes Superman from needing to be connected to ordinary people, emphasizes the “super” part at the cost of the “man” part. I think both of those aspects should be important to the Superman series, and Lois, Ma, Jimmy, Perry and others are vital to the series for that reason. I also don’t think it’d be a good idea for Wonder Woman, for similar reasons. I’m not a big believer in the idea that the DC universe is one big story—it’s a number of different series, all happening in the same continuum, more or less, but each series needs to work on its own, and needs to protect its core concepts. Superman should work as Superman, a science-fiction-y parable about a man from another planet who represents all that’s good within humanity. And Wonder Woman should work as Wonder Woman, a myth-based series about a woman warrior fighting to show us the path of peace. It’s fine for them to cross over now and again, and for the characters to both be in the Justice League, and have connections like that. But Wonder Woman’s core cast and basic series structure shouldn’t have an alien superhero from Krypton in it. It messes up the series concept, which is about Diana of the Amazons and her place in “Man’s World.” And Superman’s core cast and basic series structure shouldn’t have a woman made of magical clay and brought to life by the Greek gods in it. Each should stand on its own, with a cast and structure that serve the basic series concept, not distract from it. Plus, you don’t really have a desire to see a grand story about the death of Lois, not really. You just want her dead, or in some other way out of the way, to clear the field for Superman and the woman you’d rather he was with. I know there’s a contingent of Superman and Wonder Woman fans who’d like them together, but I’m just not one of you, sorry. I like Superman and Lois. I think she’s right for him in a way that emphasizes his humanity, which is important, because there’s lots of supervillains, aliens and monsters to punch up that emphasize his superness. And I think Diana wouldn’t emphasize his humanity anywhere near as much, while he, as her romantic partner, would undercut her mythicness by being an indigestible lump of SF in the middle of a myth-based structure. It’s fun for short bursts or in non-continuity settings, but long-term, Superman and Lois just works better. All this on top of the fact that I’m not writing Superman these days anyway. So, my apologies, but if Lois is going to be killed, it’ll have to be someone else wielding the rifle. Thanks for writing, though, and for the kind words.